After sanding is complete you may choose to condition your furniture. This is a great step to take no matter what type of wood you may be working with, but essential when working with soft wood. 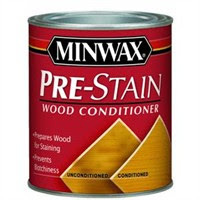 Pre-Stain Conditioner will allow the wood to accept the stain more readily, and ensure a more even coating of stain. In other words, it works WONDERS!!!!!! Just paint the pre-stain on the wood in the direction of the grain. It goes on completely clear. Wipe away excess. Let it dry for a couple of minutes and you are ready to stain!!! YAY! Don't forget to check out how to use paint and stain stripper and sand the piece of wood you are working on prior to conditioning!